The soft dunes and flat plains of this region are perfect for setting up camp and stargazing. Some of North Carolina’s most undeveloped places are along our beautiful coast. The soft dunes and flat plains of this region are perfect for setting up camp and stargazing. From state parks and national seashores to river platforms and RV parks, camping options abound. 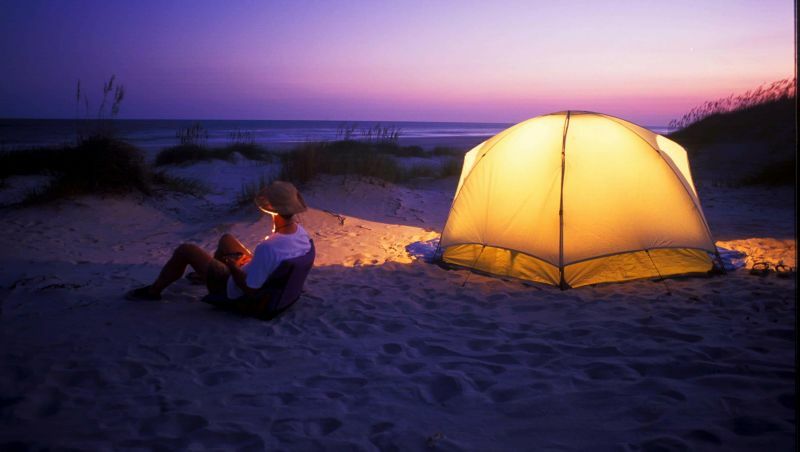 Anglers might want to set up camp on Bear Island in Hammocks Beach State Park near Swansboro. Open dunes awash with sea oats wait campers here, as well as waters chock full of fish. Puppy drum, flounder, trout and blue fish bite now as they did in centuries past, when the park was a hunting and fishing haven for Native American tribes. Kayakers will love platform camping with Roanoke River Partners, a nonprofit group that maintains the Roanoke River Paddle Trail. Campers pack all their gear into kayaks, and then paddle out to one of several platform sites located along the Roanoke or Cashie River. 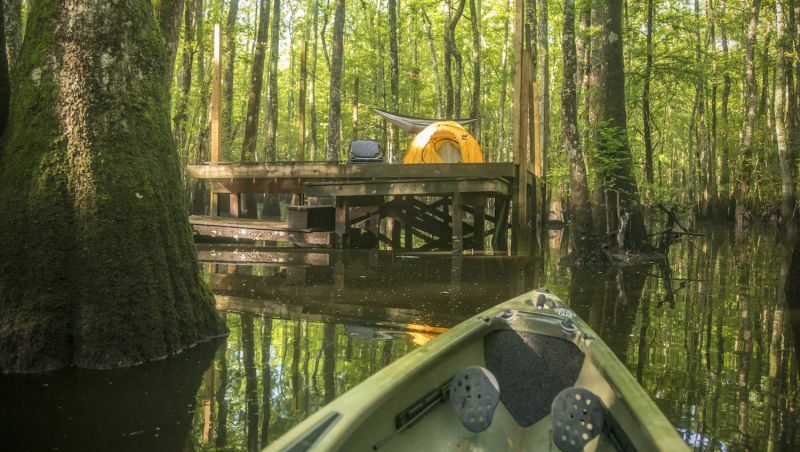 Each platform is different in habitat and amenities—some contain just the platform itself, others have covered platforms, in-ground bathroom facilities and one even has two bikes you can use to pedal to nearby civilization. Carolina Beach State Park, just outside Wilmington, sits astride the 761-acre island. In addition to RV and group campsites, the park features a marina with two launch ramps and 40 boat slips. Spot and flounder wait both the boating and shore-bound angler. Miles of trails allow you to explore distinctive habitats, including one that is home to carnivorous plants like the pitcher plant and Venus flytrap. Imagine setting up camp on the beach, building a fire and watching the rhythmic sweep of the light from Cape Lookout Lighthouse. 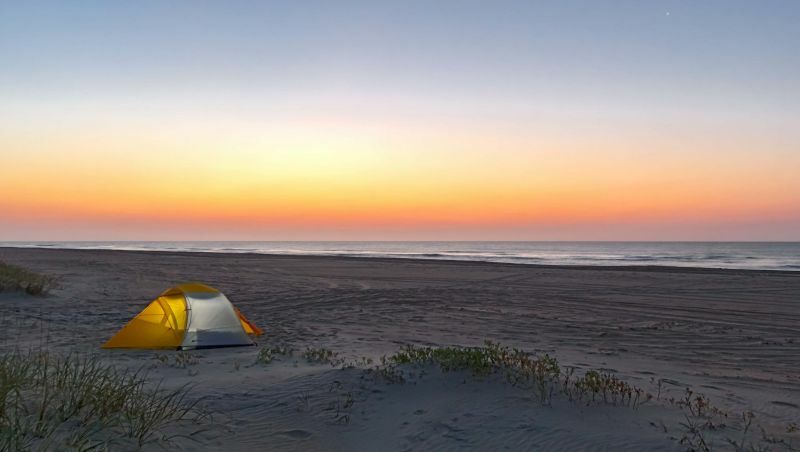 All camping within the Cape Lookout National Seashore is primitive beach camping – there are no designated campgrounds – which is what makes this a truly special experience. During the day, visit the wild horses that roam the Shackleford Banks or see historic Portsmouth Village nearby. At nearby Whispering Pines RV Park near Morehead City and Emerald Isle, families can enjoy easy access to Bogue Sound with a boat ramp and pier, a swimming pool and clubhouse, playground with a dog park and a freshwater fishing pond for anglers. With crystal clear Lake Phelps as its centerpiece, Pettigrew State Park is a wonderland for campers who are looking for both natural beauty and a taste of history. North Carolina’s second largest lake – as well as one of its oldest – Lake Phelps is a haven for swimmers, boaters and anglers. A total of 13 family campsites make it easy to explore and enjoy this scenic park. RV enthusiasts can find plenty of camping options on the Outer Banks. Camp Hatteras RV Resort and Campground is one of the largest, offering more than 400 RV sites, 15 tent sites and seven cabins. A hot tub, Wi-Fi, hot/cold water, sewer hook-ups, electrical hook-ups, guest laundry, camp store, playground, and Jet Ski and kayak rentals are all available here. Not far from the state’s northern border in Gatesville, Merchants Millpond State Park is a camping destination with water as its centerpiece. Here, coastal pond and southern swamp forest mingle, creating one of North Carolina's rarest ecological communities. 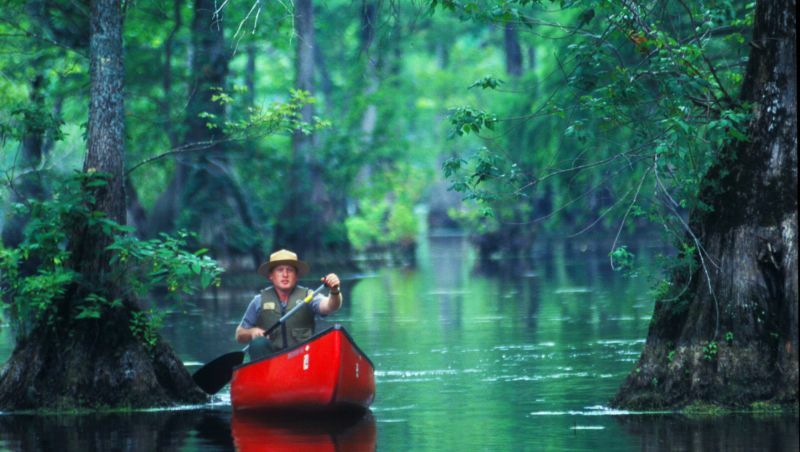 Canoeing and fishing are popular activities here, and campsites range from drive-up family campsites (tent and RV) to backpack primitive sites to canoe-up sites. Geology lovers will find Jones Lake State Park in Elizabethtown a fascinating place to explore. Jones Lake is a prime example of a geological phenomenon scientists call Carolina bays – elliptical depressions in the earth that span the Atlantic Seaboard. These “bays” aren’t connected to the sea or to rivers, and only a few (like Jones Lake) hold water. In addition to being a geological mystery, the park is a favorite spot for hiking, swimming, fishing and camping. The 20 family campsites here include a picnic table and grill, with drinking water, restrooms and showers nearby. Cape Hatteras National Seashore along the Outer Banks stretches some 70 miles across barrier islands and offers more then 30,000 acres in which to enjoy the pristine maritime environment. Four campgrounds in the park are located at Oregon Inlet, Cape Point, Frisco and Ocracoke Island. The campsites on Ocracoke can be reserved; the rest are first come, first served. Ocracoke is a favorite spot because of its 14 miles of pristine beaches, quaint village, lighthouse and maritime forest. The only way to reach the island is by ferry, but the journey is well worth the solitude you’ll find here.